VISI can work directly with Parasolid, IGES, CATIA v4 & v5, Pro-E, UG, STEP, Solid Works, Solid Edge, ACIS, DXF, DWG, STL and VDA files. The extensive range of translators ensures that users can work with data from almost any supplier. Companies working with complex designs will benefit from the simplicity with which their customer's CAD data can be manipulated. VISI can work directly with wireframe, solid, surface and mesh data or a combination of all four, providing the user with tools to work with any CAD model or to quickly construct the information from paper drawings ready for 2D machining. The intuitive operation manager has a simple tree structure displaying the machining operations and the selected tools from the comprehensive tool library. Based on piece and tooling material, many machining parameters are calculated automatically, including feeds, speeds, stepover and depth of cut. A highly graphical interface guides the user through the machining parameters, cutting conditions and holders for the selected tooling. Multiple origins enable the data to be quickly orientated around any datum or set-up for multi-axis indexing. Centre drilling, drilling, tapping, reaming, boring, helical milling, thread milling and mill drill cycles give the user a wide choice of operations to cover any combination of hole type. Selection of diameters and depths directly from the model makes it easy to enter drilling parameters and eliminate the possibility of MDI errors. Optimisation of the toolpath movement ensures the shortest distance for tool travel and reduces cycle times offering maximum productivity. The profiling operations give a choice of machining direction, circular or direct approach, and the ability to cut down to a depth with a sequence of profiling moves. 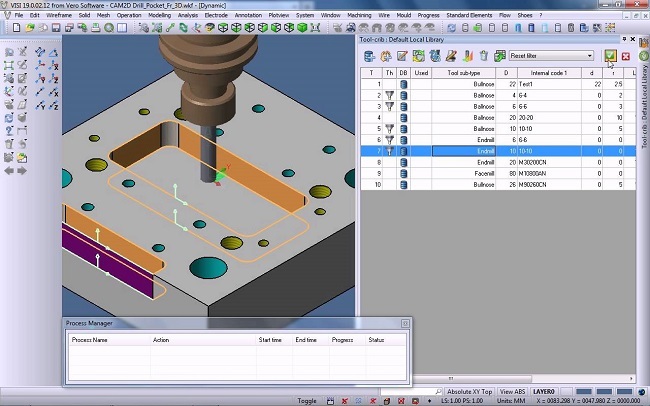 Cutter radius compensation capability provides practical CNC code for use on the shop floor. When the cutter cannot machine tight internal radii, the system will automatically create residual stock geometry (defined by the previous tool) and enable re-machining with a smaller tool. Spiral or zigzag face milling operations, with internal island nesting provide a choice of methods to clean up planar faces. Milling by successive passes allows the user to mill a profile and start away from the material, gradually moving inwards using a stepover parameter. VISI allows spiral and zig-zag pocketing operations with multi depth islands nesting including the ability to define draft angles and base radii for the pocket and island walls. Individual control for the bottom and side tooling oversize plus options for automatic island face milling provide optimum flexibility to suit individual machining requirements. For open sided pockets the user can identify the open faces and the cutter will then automatically start outside of the feature and move across the open edge to remove any residual stock. Extrusion, revolution or sweeping a 2D profile along another 2D curve provide the programmer with the ability to produce simple 3D toolpaths without the need of a full 3D machining system or indeed the need to create a 3D model. Internal and external thread milling, helicoidal milling and fillet / chamfer machining for sharp edges offers maximum toolpath flexibility. By identifying clamps and fixtures, the system will automatically avoid these using the shortest route during machining operations. Obstacle management ensures collision avoidance, and helps to reduce the cycle time on the machine by eliminating unnecessary Z retract moves. Graphical toolpath verification enables the user to check the complete cycle of operations. Simulation of the tool path shows the expected surface finish, the amount of material being removed by each operation and a warning of any potential collisions. An extensive library of postprocessors is available to suit most machine tools and all postprocessors are fully configurable to suit individual requirements. Canned cycles for drilling, subroutines to reduce program length, circular interpolation, cutter radius and tool length compensation all combine to produce reliable CNC code which is both easy to use and optimized for the shop floor. Configurable set-up sheets are automatically generated as either HTML or XLS files including information regarding datum position, tooling, cycle times and the entire cutting envelope limits.